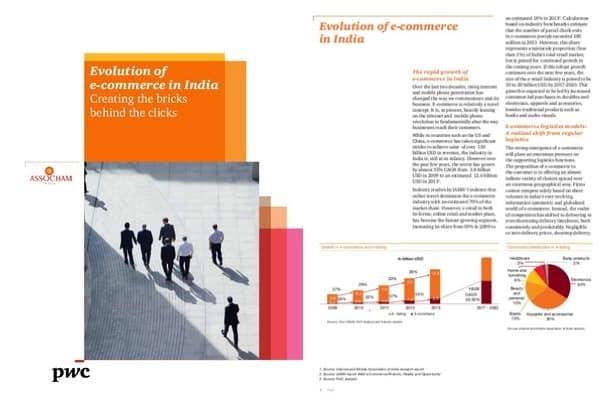 A recent report based on a research titled ‘Evolution of e-commerce in India – Creating the bricks behind the clicks’ conducted by Assocham and PricewaterhouseCoopers (PwC) revealed that the Indian e-commerce industry is expected to cross the $100-billion mark in value over the next five years, exhibiting a compounded annual growth rate (CAGR) of 35%. According to the study, the Indian e-commerce industry at present is valued at $17 billion. Carrying on the strong growth drive of 2014, the e-commerce industry is expected to see an increase of 67% in the average annual spending on online purchases per individual in 2015, to Rs 10,000 from Rs 6,000 this year, as revealed by the report. According to the study, the key factors that are significantly accounting for the increase in the number of consumers making purchases online are improvement in infrastructure such as logistics, broadband and internet-ready devices. As per the estimation goes, 65 million consumers in India will purchase online in 2015, as against around 40 million in 2014. Although, steep discounting by e-tailers became a concern for a number of marketers still the fact that the flash sales and daily deals have contributed a lot in the growth of e-commerce in India can’t be overlooked. Another big reason behind the fast ecommerce growth is the increasing adoption of smartphones and tablet consumers. As far as the shopping categories are concerned, apparel sales remain most popular capturing the biggest share of Indian e-commerce retail, followed by that of computer and consumer electronics. Both these categories are expected to power the market in future as well. As per the study, computer and consumer electronics and apparel and accessories are together estimated to account for 42% of total retail e-commerce sales in 2015, as compared to this year with 39%. With 75% of its total industry moved to online commerce, travel and tourism are also fast growing segments. Other things that have moved to the internet encompass a major portion of services such as air, train, bus, movie ticket bookings, hotel reservation and tour packages. The e-commerce industry as per the report is expected to spend around 2-6% of the revenue on warehousing and sortation centers between 2017 and 2020, which would translate to $450-900 million. Talking about the employment sector, the e-commerce industry is likely to an additional 100,000 people in warehousing and logistics as there are over the around 25,000 persons already working in the segment.